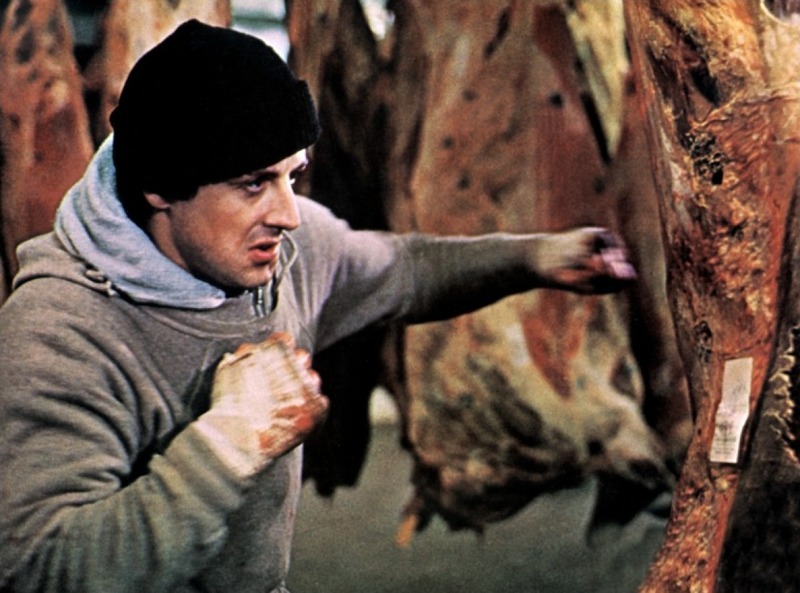 My favorite movie character of all time is Sylvester Stallone’s creation, Rocky Balboa. He was a nobody, a chump, a has-been of a boxer working part time for a loan shark. The only difference between Balboa and the other nobodies is that he never learned to stop swinging. That’s the crux of the movie’s plot – the main character gets an opportunity, and by being relentless in his training and the honing of his skills, he gets within a breath of the pinnacle of boxing’s most sought after crown. What fascinated me after I saw the movie (and applied its principles to my own overweight existence) was how closely the storyline itself mirrored Stallone’s life. He was down to his last dimes trying to convince producers to shoot the film from his screenplay, with him in the leading role. He was practically destitute, but never gave up on the dream of the film being made. While most of us would have quit and went out and got a job to pay the bills, he hung in there. He, like the movie character that would make him a global name, kept swinging. We’ve all heard the stories of the winners that would never quit: Edison and his lightbulbs, Michael Jordan getting cut from his high school basketball team, Stephen King rejecting his own work by throwing the manuscript for “Carrie” into a trash can. Fame and Hollywood riches aside, you and I can see the no quit and “keep swinging” mentality everyday. If you look close enough, it’s right there in friends and family members, in big numbers. My Godmother told my wife and I stories of her life as an immigrant, coming to America from Sicily. She, my grandmother, and other members of the family were mistreated, strip searched, degraded, and faced every form of racial slur. Instead of crawling into protective shells, they kept swinging. They carved out inspirational lives in the country that they came to love with a passion, despite the rocky start. They were awash with perseverance, for the sake of their family and the new country that would eventually realize their worth. My grandparents would live a hard, blue collar life that would eventually bring them financial success. Because they kept swinging. When they lost their son, my uncle, as a teenager, they turned insurmountable grief into a positive years later. They built their house, built another business, and helped build the lives that came after. They never let us forget a boy named Anthony. They made a home where love was the key, and tenacity followed until their final days. They never stopped swinging. Edison finally got it right after thousands of light bulb failures. Jordan put in hour upon hour of jumpshots to improve his game. You could say that Stephen King does pretty well in the publishing industry, too. Stallone turned Rocky into a franchise that grossed millions of dollars and inspired many to chase their own heavyweight dreams. It’s the small details and the ability to keep swinging that get you to where you want to be. One of my forged memories include a Sicilian immigrant, hunched over a plastic tub of ground beef in her kitchen, prepping a dish that would make her restaurant famous in our little town. She was a little girl, without English speaking ability, a stranger in a strange land. She repeated habits and actions thousands and thousands of times, the actions that, as an older woman, would make her a household name in our city and multitudes of friends in the process. Like this post? Awesome! Share your thoughts by leaving a comment below. All feedback appreciated! Keep swinging is one of my favorite sayings. Well I knew about Stephen King tossing “Carrie” into the trash can. Good thing his wife read it, huh? Michael Jordan getting cut from his high school basketball team. Hmmm, never would have guessed! Love this post and you know how I feel about tenacity. Gotta be a bit pugnacious like old Rocky to get anywhere, unless you’re blessed with good luck or a small fortune! Always love the way you tie your fascinating family roots into these posts. Have a good one, Sir!